Lord of Takanashi, the 14th episode of Working!! !, was broadcast in advance on Tokyo MX on December 26, 2015. Note: Don't read review if you haven't watched previous seasons of Working!! due this containing info on the latest season! This concludes the Working!! series and I've gotta say, this episode ended the whole series so well and was able to leave everything on a surprisingly good note. As soon as you finish this episode, I can guarantee that you will be very reminiscent of all 3 seasons of Working!! and be glad you watched it. - Inami losing her fear of men and prevents herself from punching them. - Popura gaining new responsibilities by being promoted to Chief of the Wagnaria! restaurant. Not only does this 49 min episode/special resolve Takanshi's problem with his mother which occurred in the previous season, but it also manages to have Takanashi and Inami's relationship grow as well. By the end, their odd friendship resulted into them loving each other and they become a couple. What makes this episode so great in my opinion is that it shows again what the Working!! cast have been through and how they're able to officially resolve problems that affected them in the past. Though the problematic situations they faced are unrealistic to a certain extent, how they all are able to overcome these challenges is what made me like it so much. It felt engaging and made you care more about the characters (even if you haven't before). The best thing about Working!! is that you begin to care more about the characters and love each quirk they have. They feel almost like family; and when they move on in life (like Yachiyo for example) you can't help but hope for the best for them despite them not being real people. I would have to say the only downside to this episode is how it had to be separate from the 3rd season. Because in actuality, this is supposed to be the last episode of that season. So if you decided to treat this as it's own individual episode (like an OVA) it wouldn't be right since this is continuing off right where season 3 ended. But overall, I would have to say this one of the best ways to end Working!! as a whole. I can't think of a better way to end the whole franchise. When I finished this episode, I couldn't help but feel this empty place in my heart to be honest. Sure I sound really sappy, but it makes the viewer remember what Working!! has done and completes the journey you've watched. And this episode does such a splendid job on ending the journey. 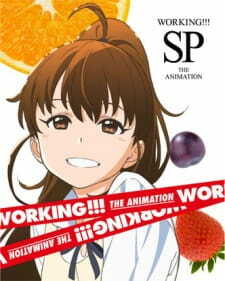 This will be a short review void of any spoilers for the 3rd season of Working!! and its hour long finale. What a great end to the season of Working!!! and the series as a whole. Unlike most Slice of Life/Comedy anime, this season has a lot of closure, the characters grow up and mature a lot from the first season and all the side stories/teasing relationships you thought were just running gags all get fitting and nice resolutions to bring them to a close, with the finale bringing the main characters problems & relationship to a heart warming ending. To anybody who has enjoyed the previous seasons with all the different characters quirks and personalities and to anyone who enjoyed the funny little side stories that involved all these characters you will surely love this last season and its finale. So this is really the cherry on top of the first three seasons. The main reason this episode came out was to wrap up everything that was left hanging at the end of the third season; Takanashi's mother and Inami's feelings and Taneshima becoming the next chief. This episode really doesn't deviate too much from the aura that the first three seasons had. It wasn't just some OVA episode that had nothing to do with the main story, in fact, this is essential to finishing up the story. It's ambience doesn't change much except for some small heartwarming scenes and the addition of Takanshi's mother. Nothing too special except for some of the crying scenes or reaction scenes. They really reused a bunch of ost that have already been placed and it feels nostalgic actually if you've been following the Wagnaria!! series since it was released, but I can't give it a higher rating under good conscience. This is where the show truly shines. Every character has their own personality and their own way of creating humorous scenes. No character truly ever gets the short end of the stick, you get a good handful of their personality and that is what makes this show great. There is a large amount of character development as well. The majority of the comedy this show brings is like the rest of the three seasons; slapstick comedy and comedy based on misunderstandings. But, that's not to say it wasn't good. For a 50 minute episode, it was awesome. If you watched the first three seasons, there is no reason to not watch this. It wraps everything up very satisfyingly and the ending to this episode is very heart warming. Meeting new characters, seeing them grow, and having fun with them. Being there- being part of everyone's adventure at Wagnaria is an adventure itself. Everything has been memorable and precious. I don't know how to explain this sensation in my heart, but I'm overflowing with joy. The finalie was so fulfilling and satisfying; it was perfect. The only way to end such a wonderful show. This feeling that Working!! has given me will keep me warm for a long time to come. "Thank you! Please come again." The story was light, but also has depth. It had the right mix of elements- making great use of a family restaurant setting to bring about its slice of life and comedy, and the skillful portrayal of characters and their growth bore tension and romance. The airing date smells a little bit odd?